When you think of the Lunar New Year, usually, this fruit comes to mind. Yes, i’m talking about orange. Oranges are used during the Lunar New Year as an exchange to the person .Other than serving tidbits and oranges to your guests, why not bake an orange cupcake. Today, I would like to share with you a quick and easy recipe which involves the use of oranges. Before you start baking, please remember to pre-heat your oven at 180°C for 10 minutes. Step 1: Beat the butter, sugar, egg yolks, and vanilla in a mixing bowl until it is thoroughly mixed. Step 2: On a separate bowl, mix flour, salt, and baking powder. Step 3: Add the ingredients from Step 2 and Step 1 bit by bit alternating with adding portions of the orange juice to the creamed mixture. Step 5: Beat the white eggs and mix with the ingredients in Step 3. 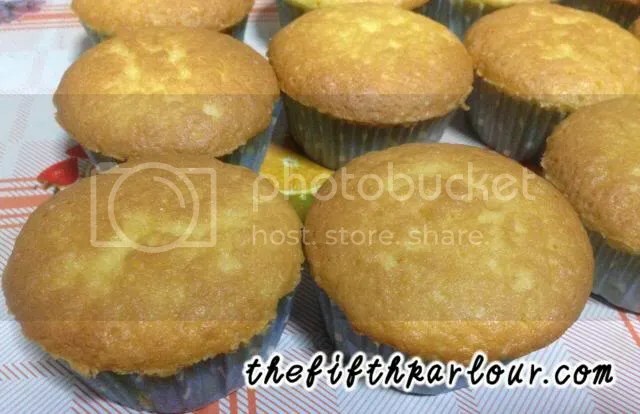 Spoon batter into cupcake holes until ½ full. Bake the cupcakes for 25-30 minutes at 160. To ensure that the cupcake is baked, you will need to use a toothpick to see if the batter is still wet or dry. Adapted from: Baking Makes Things Better! The Fifth Parlour would like to wish all our readers a very Happy Lunar New Year! Lets welcome the Year of the Horse with a bang! Sorry for the long absence. I didn’t bake much but tried my hands on orange cupcakes since it’s the Lunar New Year. I didn’t manage to taste the cupcakes because all 12 cupcakes were taken before I could even have a bite. If I were to make it again, I would add in more orange juice so that it will taste more orange taste to it. Do follow me on my other blog where I do sometimes post about cakes/cupcakes too!